Pachmarhi situated on a large plateau ringed by hills on the evergreen central Satpura ranges, is known as the Queen of Satpura for its spectacular beauty. The hill station at a height 3550 ft. is located in Hoshangabad district, Madhya Pradesh. The place is surrounded by low lying rugged hills, ravines, beautiful forests, 12 breathtaking waterfalls, serene pools and quiet glades. The saucer shaped valley of Pachmarhi, was discovered by Captain James Forsyth of the Bengal Lancers in 1857, and was developed as a sanatorium for the British troops. The point where he first sighted the area, was named after him as Forsyth Point but later renamed as Priyadarshini Point. The valley with its not too cold but pleasant weather served as the summer capital of the central provinces during the British regime. The Victorian churches, bungalows and cemeteries left behind bring back remnants of the colonial past. Besides its colonial atmosphere, the hill station has archeological relevance as well as religious significance with its ancient rock paintings in cave shelters seen in many locations of the region and the famous Shiva shrine located in the Mahadeo Hills. The rock paintings left behind are seen in different locations in the Satpura hills and the earliest of them dates back to 10,000 BC. The name Pachmarhi itself is derived from Panch- Marhi (five caves) believed to be the abode of the Pandava brothers of the 'Mahabharata' fame, for sometime during their exile. The valley which is home to tribal Gonds and Korkus has a maze of forest tracks apt for pleasant treks. The national park at Pachmarhi has dense forests and is home to the gaur, leopard, bear, bison and other wild animals. The place has a number of interesting tourist spots located at a short distance from each other. If you are not keen on walking, hiring a jeep or scooter at the bus stand in Pachmarhi town, is the best means of visiting the places. Jatasankar is a sacred cave under a mass of loose boulders situated 1.5 km from the bus stand in Pachmarhi town. Nearly half the distance to the cave can be covered on vehicle while the rest has to be covered on foot. The 'samadhistha Shiva' under a natural formation that resembles the hood of a giant serpent in the cool dark cave is a place of abiding sanctity and the striking rock faces is a wonder of nature. The name 'Jatasankar' itself is derived from a rock formation resembling the matted locks of Lord Shiva. The cool waters of Jambu Dwip stream takes its source from this cave. The overcasting little rocks, many of them hanging precariously between the huge walls of rock cutting changes colour from green to golden yellow when light reflects on them. The place has a serenity about it which could attract tourists. On the way to Jatashankar, there is a temple of lord Hanuman, in which the idol has been carved out of a piece of rock. Very close to the Jata Shankar Shrine is the Harper's Cave, so named because of one of its paintings depicting a man seated, playing a harp. Five ancient caves carved out of a low hillock. The name Pachmarhi itself is derived from these Panch- Marhi (five caves) believed to be the abode of the Pandava brothers of the 'Mahabharata' fame, for a long period during their exile of 12 years. The cleanest, most airy of them is known as 'Draupadi Kuti' and the dark one, the 'Bhim Kothari'. Some motifs and a brick stupa were discovered above the caves. Archaeologist claim that these caves must have been constructed by Buddhist monks during the Gupta period, in the 9th or 10th century A.D. but the popular belief, that the Pandavas had lived here, still continues. By the side of the Pandava Caves a road leads to this spot which is accessible only on foot. The pool is formed by a little fall which is nearly 30ft high The pool is an ideal place for swimming and diving. A swimmer can reach under the fall after swimming the short distance of the pool which gradually gets deeper near the fall. Others can enjoy their dips in the shallow end of the pool. It is situated nearly half a km towards east of Apsara Vihar. Those seeking adventure will find it in this ten minute walk over rocks and boulders from Apsara Vihar to the top of Rajat Pratap, the big Fall. The height of the fall is nearly 350ft and it looks as if a strip of silver is gliding through. It is rather difficult to descend and tough to reach near the fall as it is nearly 3km and is very strenuous. Only adventurers and trekkers can negotiate the path which goes round the hill on the left view of the point. This hill fascinated late Dr. Rajendra Prasad, the first President of India and is named after him. He visited this place a couple of times. A very important person's beautiful house known as Ravi Shankar Bhavan was constructed for his comfortable stay. A glimpse of the building can be had from this hill. The beautiful scenery all around will enchant you, particularly the three dominating peaks on the southern -western crest of the valley. Formerly known as Forsyth point, named after Captain James Forsyth of the Bengal Lancers who discovered the valley in 1857, from this point. The view from this point is spectacular especially at sunset, when the three dominating peaks; Chauradeo to the left, Mahadeo in the centre and Dhupgarh, the highest point in the Satpura ranges to the right; appear glowing red and fiery in the setting sun against the purple background of the sky. The deepest ravine at Pachmarhi nearly 300ft deep. The ravine is densely wooded with steep sides and the hum of water can be heard gushing far below. Legend says that Lord Shiva imprisoned a large, evil snake which actually was a demon and buried it in solid rock in this ravine. The local natives used to call it Andhi Kho which later took its current name. There is a clearing with a railing from where one can take a look at the ravine. The way to this holy centre for the Hindus, 10 km from the town is through dense Sal forests with precarious hairpin bends and curves. The cave shrine here, with a 100m walk to the entrance has a large 'shivling'. The inside of the cave is cool with drops of water trickling from its roof. The trickling water forms a holy depository in which the devotees can take a dip. There is a legend behind the existence of this shrine. The evil demon Bhasmasur undertook a long penance to please Shiva and was finally rewarded with a boon that he could reduce any living creature to ashes by placing his hand on its head. After obtaining the boon, the demon wanted to try it out on Shiva himself. Shiva fled and thrust his head into the Mahadeo caves. Lord Vishnu came to his rescue in the form of a beautiful damsel and lured the demon to put his hand on his own head which resulted in his destruction. The pond outside, by the side of the cave where the demon is believed to be actually burnt to death is known as Bhasmasur Kund. Mahadeo has been a centre of pilgrimage for the last many centuries. Since time immemorial Hindus have been coming to Mahadeo to pay their homage to Lord Shiva. Now a large fair is held on Shiva Ratri when nearly two to three lakhs of people visit Mahadeo and nearby Chauragarh on this occasion. There is Gupta Mahadeo, a narrow dark gully nearly 30 ft. formed by two rocks. Inside there is a darshan of a natural 'shivalingam'. Chauragarh is a 4 km sheer climb with 1300 steps from Mahadeo. There is a temple on the rectangular top with an idol of Lord Shiva. Ardent devotees make the strenuous climb, sometimes carrying Triscends (Trishuls) on their shoulders as an offering to Lord Shiva. This tradition is followed as a mark of devotion, especially during Shivaratri. The trishuls may be of differing weights some weighing up to three to four quintals. There is a Dharmashala for relaxation. 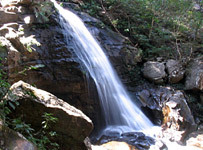 Situated only 3 km from the town, Bee fall ( now known as Jamuna Prapat ) is a spectacular fall in the stream which provides drinking water to Pachmarhi. You can walk up the perilous road or hired Jeeps can take you up to the place where you can have not only a glimpse of the fall from above, but also the beautiful scenery as well. The bathing pools here are very popular. There is half a kilometer pathway down to the fall. An ideal place to spent a day with family and friends. Reechhagarh is situated just one kilometer further off the airstrip, on the right side of the main road. A half kilometre walk takes one to the wonderful natural amphitheatre in rock, approached by a semi dark and large open cave like entrance on the south side. The large underlit structure of rocks looks like a great hall. These rock shelters are believed to be of 10th or 15th century B.C. with pre-historic cave paintings. Excavated in 1930, they depict the scenes of hunting, dancing and war and some of them are fully coloured. The spot is less than an hours walk from the road. In the excavation carried out years back, a skeleton of a human being measuring nearly seven feet was found. Besides these rock- paintings, the place has a natural setting and lyrical charm also. The falls can be reached only on foot. The descent is steep and the trek strenuous for almost all of the 4 km to the base of the fall's first cascade. Crossing the stream below Duchess Fall and following a footpath about 2.5 km in a south- west direction about 35 min. walk, brings one to a huge rocky pool that is excellent for a refreshing swim. The pool is very deep and only excellent swimmers dare swim in it. The highest point in the Satpura range, with a magnificent view of the surrounding ranges. A very popular spot for viewing sunsets. There is a 1000ft ascend from the road level if traveling on foot or riding a bicycle. The peak 4429 ft. high from the sea level also called the Elephant can be reached by road from the north side. The view is spectacular with the mammoth rock formations reflecting the light in a variety of delicate shades of purple and violet. There is a rest house here where you can spend the night. Bookings can be done through the local P.W.D office. Set up in 1981, Satpura National park is 524 sq.km in area. It spreads to the west and north of Pachmarhi, through a dense forest of evergreen sal, Teak and bamboo. The highest peak of Dhoopgarh and Mahadeo is located here. This park is home to guar, bison, tiger, leopard, bear, four horned deer, blue bull etc. and many colourful rare birds. The high peaks with the deep valleys, rivulets, water falls and Tawa's vast reservoir combine to give this park unique and breathtaking beauty. If you wish to spend a day or night in the park, obtain the permission from the Director, National Park office (Phone : 07578- 52130). There is the Churna Tourism Bungalow which offers basic accommodation and food, and also the forest bungalows at Bori and Dhain. The park also runs a museum called 'Vaniki Sangralaya' at the Bison Lodge(1862), the first building that was constructed in Pachmarhi by the British. It is advisable to take a four wheeler preferably a jeep for the tour. The entrances are from Panarpani gate, which is close to Pachmarhi to reach Neemghan or from the Rorighat end. Built in 1892 by the British, the Catholic Church is a blend of French and Irish architecture. Its Belgium stained-glass win-dows add rare attraction and beauty to the building. The Church has a cemetery attached to it and graves date from 1859, World War I and II. Build in 1875 by the British, the protestant Church's architecture is fascinating; its 'sanctum-sanctorum' has a hemispherical dome on top with its ribs ending with faces of angels. The stained-glass panes adoring the walls and rear of the altar were imported from Europe. They present a gorgeous view as sun rays pass through them.